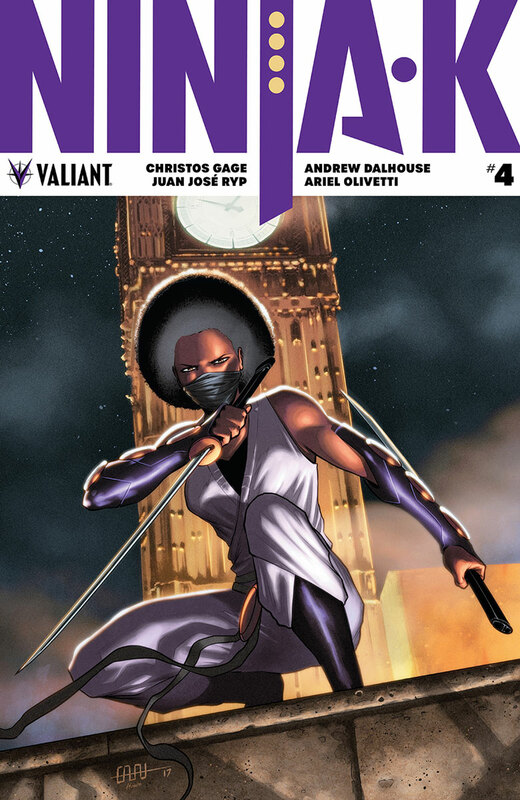 The Fellowship was fortunate enough to obtain a copy of NINJA-K #4 from Valiant Entertainment. The stories are written by Christos Gage; with art by Juan Jose Ryp (main story) and Ariel Olivetti (backup), colors by Andrew Dalhouse, and lettering by A Larger World Studios. Colin has located Ninja-G, to find out more about the mysterious The Acclimation Bureau and to find out if the information Ninja-C told him was true. She tells him how she became the first black female ninja in the program, plus what she did for queen and country. She also explains what caused her to “retire” from the Program and start a new life. Armed with this plus some information about the Bureau, Colin decides he’s ready to take them down… The backup tale continues the story of the first Ninja (or Ninja-A) and the beginning of the Ninja program of MI6. I loved the previous series written by Matt Kindt, but Christos Gage has been hitting it out of the park with every issue. He’s taken a great series and elevated it while deepening the lore of Ninjak. Juan Jose Ryp and Ariel Olivetti’s art is top notch as always, and is aided by the beautiful and striking color palette of Andrew Dalhouse. NINJA-K is a treat for the mind and the eyes. Check it out. NINJA-K #4 is in stores now or available at valiantentertainment.com.